The Baltimore Orioles visit Miller Park on Monday, July 3, 2017 to play the Milwaukee Brewers. The probable starters are Wade Miley for the Orioles and Paolo Espino for the Brewers. The opening line for this matchup has Baltimore at +163 and Milwaukee at -173. The Orioles have a 42-35-3 over/under record and a 36-44-0 run line mark. The Brewers are 47-36-0 against the run line and have a 45-34-4 over/under record. The Orioles have a 39-41 overall record this season. Starting pitcher Wade Miley has a 3-6 record with an earned run average of 4.54 and a WHIP of 1.66. He has 74 strikeouts over his 81.1 innings pitched and he's given up 89 hits. He allows 9.8 hits per 9 innings and he has a FIP of 4.97. The bullpen has an earned run average of 4.32 and they have given up 311 base hits on the year. Teams are hitting .265 against the bullpen and they've struck out 263 hitters and walked 119 batters. As a team, Baltimore allows 10 hits per nine innings while striking out 7.4 batters per nine innings. They are 29th in the league in team earned run average at 5.08. The Orioles pitchers collectively have given up 794 base hits and 404 earned runs. They have allowed 122 home runs this season, ranking them 3rd in the league. Baltimore as a pitching staff has walked 308 batters and struck out 587. They have walked 3.9 men per 9 innings while striking out 7.4 per 9. They have a team WHIP of 1.54 and their FIP as a unit is 5.13. As a team Baltimore is hitting .253, good for 16th in the league. The Orioles hold a .424 team slugging percentage and an on-base percentage of .309, which is good for 26th in baseball. They rank 13th in MLB with 8.8 hits per game. Jonathan Schoop is hitting .297 with an on-base percentage of .352. He has 85 hits this season in 286 at bats with 51 runs batted in. He has a slugging percentage of .545 and an OPS+ of 137. 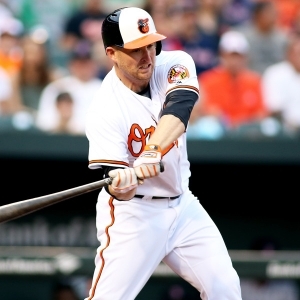 Mark Trumbo is hitting .252 this year and he has an on-base percentage of .313. He has totaled 80 hits and he has driven in 39 men in 317 at bats. His OPS+ is 91 while his slugging percentage is at .401. The Orioles have 705 hits, including 131 doubles and 112 home runs. Baltimore has walked 206 times so far this season and they have struck out 717 times as a unit. They have left 526 men on base and have a team OPS of .733. They score 4.45 runs per contest and have scored a total of 356 runs this year. Milwaukee has a 44-39 overall mark this year. With an earned run average of 4.60, Paolo Espino has a 0-0 record and a 1.21 WHIP. He has 10 strikeouts over the 15.2 innings he's pitched. He's also given up 13 hits. He allows 7.5 hits per nine innings and his FIP stands at 6.71. The bullpen has an earned run average of 4.13 and they have given up 272 base hits on the year. Teams are hitting .244 against the Brewers bullpen. Their relievers have struck out 284 batters and walked 145 opposing hitters. As a team, Milwaukee allows 8.8 hits per nine innings while striking out 7.9 batters per nine innings. They are 12th in the league in team earned run average at 4.19. The Brewers pitchers as a team have surrendered 730 base knocks and 348 earned runs this season. They have given up 101 home runs this year, which ranks 14th in Major League Baseball. Milwaukee as a staff has walked 290 hitters and struck out 659 batters. They give up a walk 3.5 times per 9 innings while they strike out 7.9 per 9. Their team WHIP is 1.37 while their FIP as a staff is 4.42. As a team, they are batting .253, good for 17th in the league. The Brewers hold a .450 team slugging percentage and an on-base percentage of .324, which is good for 17th in baseball. They rank 17th in MLB with 8.6 hits per contest. Eric Thames comes into this matchup batting .241 with an OBP of .369. He has 62 hits this year along with 40 RBI in 257 AB's. He maintains a slugging percentage of .537 with an OPS+ of 133. Domingo Santana is hitting .273 this season and he has an OBP of .368. He has collected 73 hits in 267 at bats while driving in 43 runs. He has an OPS+ of 119 and a slugging percentage of .479. The Brewers as a unit have 716 base hits, including 153 doubles and 125 homers. Milwaukee has walked 273 times this year and they have struck out on 796 occasions. They have had 546 men left on base and have an OPS of .774. They have scored 4.84 runs per game and totaled 402 runs this season. Who will win tonight's Orioles/Brewers MLB game against the spread?